The branch of the Minor family from which I spring left New Jersey in the late 1790s and settled along Big Whitely Creek, Greene County, Pennsylvania. Abia and Margaret (Pearson) did not homestead in isolation, and may well have lived within the fortified structures that uncles John and William Minor had built in the area. By 1803, Abia and Margaret aspired to their own farm along the waters of Big Whitely, and on 2 February Uncle William Minor and his wife, Hannah, conveyed title to 150 acres of “Race Ground”, for the sum of $1,700 “of lawful money of the United States”. The oak studded hills had been conveyed or patented to William from the Commonwealth of Pennsylvania in 1789. In 1803 the creek-side land became the childhood home of my patriarch–John Pearson (Pierson) Minor. Shortly after posting this piece, I received an email from reader and cousin, Linda Bell. My colleague strongly suspected that the face was familiar, not just family-like, as if she had seen the photograph before. Perhaps, Linda suggested, this face appears in Bates’ History of Greene County, Pennsylvania (©1888) which can be read online at the Internet Archive. And yes, he was there…This post has been updated to reflect the new information. Portions of the original post have, therefore, been deleted. I have stared at the last half of the Minor Family Album for a month now, confounded by more than one photograph. None are annotated with given names, or family names, or even a hint of a date. I look at the next cabinet card with a hand lens. I scan it into my hard drive, enhance the clarity and then look again, with the computer as hand lens. The paper photo drops crumbs of information, which I collect and line up, willing a trail to appear. The photograph was produced by Thomas W. Rogers of Carmichaels, Pennsylvania, on ivory colored cardstock with rounded corners, and the simple, red-ink trademark on the back. The photograph, whether original or a copy, was made most likely between the late 1860s and early 1870s, early in TW Rogers photographic career. Mr. Clean-shaven is between 50-65 years old, with thick wavy hair worn in a conservative above-the-collar fashion. The white mane sweeps from right to left above his bushy salt-and-pepper eyebrows. Puffy half-moons beneath light-colored eyes cushion his intensity; this is a busy man with little patience for sleep. The gaze, the wavy hair, the Roman nose, the bushy brow…features shared with other Minor family members. My wavy-haired gentleman is wearing a starched white shirt, with a heavily starched, detachable collar. He has tied a black silk cravat into a flat bow tie at his throat. Over this he wears a black, collarless, single-breasted vest, trimmed in braid fashionable in the late 1860s. All of the buttons are fastened, without any evidence of a watchchain. The double-breasted sack coat is also made of black wool and trimmed in braid. The buttons and button holes go very high into the lapel, which is notched quite deeply, the lower portion much wider than the upper portion at the neck. The fit is quite generous, particularly at the sleeves, which sit on the shoulder, a style worn in the late 1860s-early 1870s. This clean-shaven man had his portrait taken at the height of his career, when he was about 55 years, between 1868-1872. Fortunately, Samuel Bates included an illustration based on this very photograph in his History of Greene County, Pennsylvania (1888), which accompanied a biographical sketch of a very prominent Baptist minister–Charles W. Tilton. Born to New Jersey residents Enoch and Elizabeth Tilton in 1815, Charles spent his childhood on the family’s farms. The youngster attended local subscription schools in western Pennsylvania and Frankfort Academy in Beaver County, Pennsylvania. Tilton’s first vocation was as a teacher, but he was called to the ministry. In 1843 Teacher Tilton was ordained a Baptist preacher, and began a life of service inside the Ten Mile Baptist Association, Greene County, Pennsylvania. Reverend Tilton filled the pulpit at several Ten Mile churches, at times perhaps simultaneously, including Goshen Baptist in Garards Fort, home church to my Minor ancestors. Pastor Charles was a reknowned revival leader during the post-war years, leading congregants to a healing place after the horrific losses and community ruptures of the Civil War. (Greene County was a Democratic Party stronghold, fiercely opposed to the concept of emancipation.) This photograph was taken during this time. As a revival preacher, Sabbath School leader, and a higher education advocate, Charles W. Tilton was famous among the Baptists of Greene County, and probably well acquainted with the Minors of Ceylon Lane. Little wonder that the man’s photograph was sought by my great-great-grandmother, and later displayed, among family, for posterity. Have you ever wondered if anybody ever reads what you have so passionately researched and diligently recorded? Just as I despair that my family storytelling has NO audience, I got a comment, followed by a description, followed by an email with PHOTOGRAPHS. This post was originally published two years ago, and today, because of curious reader, I have additional descriptions of land purchased 170 years ago by John Pearson Minor. 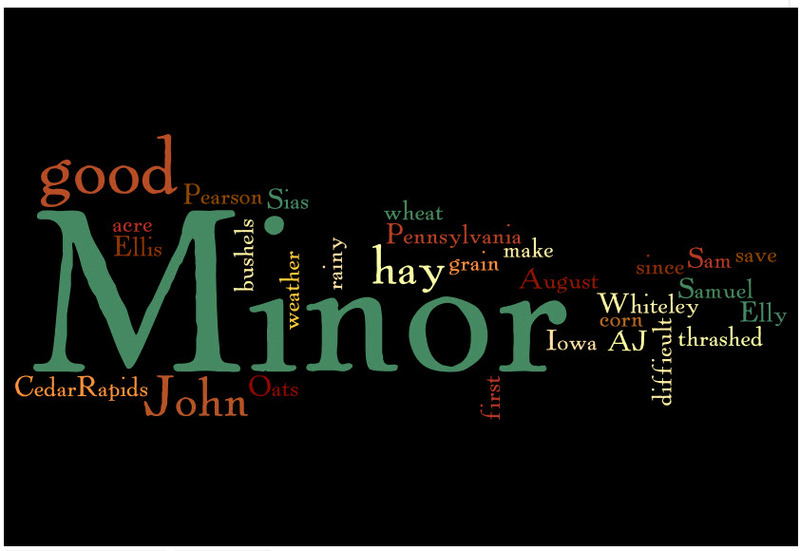 Five hundred and seventy-five was the amount of land that John P. Minor purchased from James P. Wilson in 1841 and 1842. As I reread those deeds I traced my finger along the lines of this map, and with great excitement realized that I did indeed have a map which depicted the Minor land acquisition of 1841 and 1842 in Harrison County, (West) Virginia! With that confirmed I could with great certainty know that the bigger stream indicated Simpson’s Creek, and the smaller streams were Limestone Run and Stout’s Run. However, I still didn’t know when this map was created or where this parcel of land was on a current map. 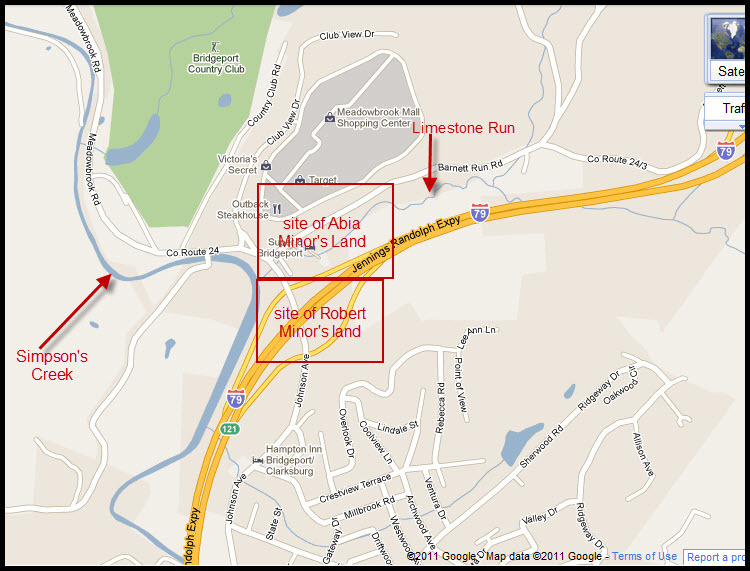 The 1849 document transferring a piece of this property to Abia and Robert Minor was never executed. It was as if the boys had given John P. some reason to pause before deeding title. 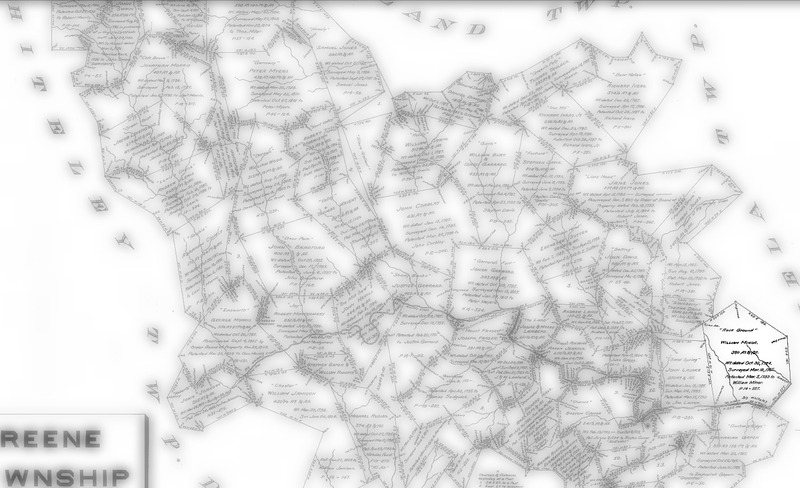 BUT the document gives a surveyor’s description of the considered transaction, and that plot is only the piece labeled R. Minor in this map–a clue that this map was created sometime AFTER 1849. Other documents related to this land include John P. Minor deeding the tract of land labeled here A. Minor to Abia Minor in 1854. 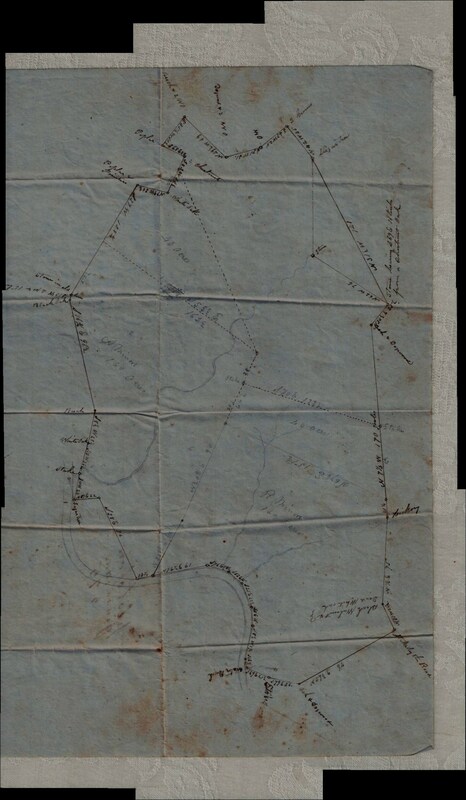 Therefore, I conclude that my surveyor’s map was created sometime between the years 1849 and 1854. The when of the map was closer to being settled at this point, however I was left no closer to understanding where these 575 acres were located. For that I consulted the Federal Census data hoping to track the residences of the young men. My hunch was rewarded with an interesting trail. If Robert was on that land so long then searching for a map of that 1860-1880 era might yield some clues. 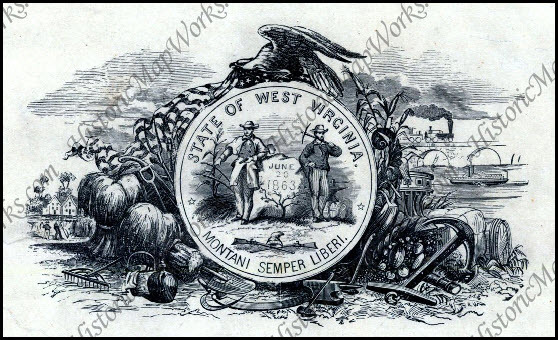 At Historic Map Works I did indeed find such a map–An Atlas of West Virginia, published by D. J. Lake and Company in 1886. This map labeled not just towns and streams, but homes and businesses. I found Robert Minor’s name by a square that sat on a small stream, presumably Stout’s Run, that emptied into Simpson’s Creek north of Bridgeport. Limestone Run had been renamed Barnet’s Run by 1886. With these facts I could look at a Google map with new eyes and locate the ‘Plot Virginia Land 575’. Limestone Run was renamed Barnet’s Run by 1886, and the farms were covered by interstate and malls by 1986. A mystery is solved, and leaves me with mixed emotions. Now I know where my ancestor once walked; where, finding coal and water and good land for farming, John P. Minor expected to give his sons a great leg up in life. Phillip Wilson stopped by my blog, and read through this post, recognizing immediately that he grew up on Robert Minor’s farm. His parents, Robert and Helen Wilson, purchased the land in 1962. Their home, built around 1940, sat close to the “cellar house”, the basement of the original home. Phillip played for hours down by the creek while his mother kept a watchful eye from the patio, til they paved paradise and put up an exit ramp. **With sixteen passes of the Flip Pal I had successfully scanned the map before me and stitched it together into a seamless jpeg file with the built in Stitch Tool. Flip Pal. LOVE. IT. Check it out here. How many of us stand on the hopes and dreams of the pioneering Minors? With yesterday’s publishing of the 1872 letter between brothers Samuel and John, I am reasonably certain that I have many unmet cousins in the Midlands and West Coast states of America. Collating the data from the letter, a Thomas Minor Society register, and Federal and state census reports from 1850, 1860, 1870, and 1880, I can track one piece of the Minor Migration. Somewhere, out there, beneath the waning gibbous moon, I have cousins in Iowa, Illinois and Oregon. 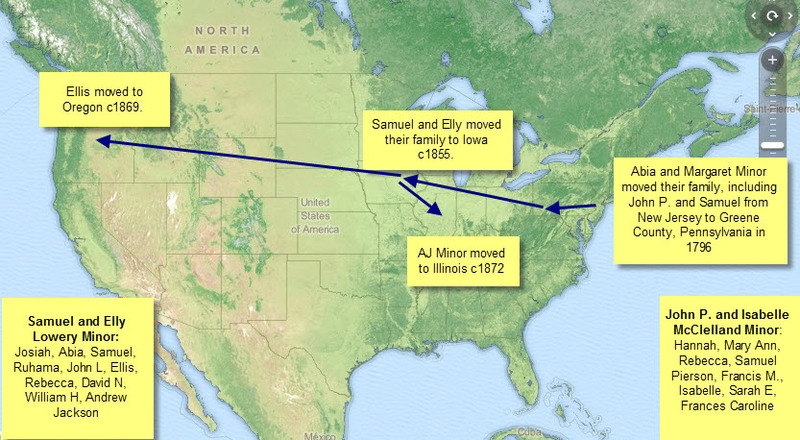 If you are one of the migrated Minors, I hope you will leave a message, continuing the conversation begun almost 140 years ago between brothers Samuel and John. ABIA MINOR was a resident of Moultrie County, Illinois when he wrote this letter to his father, my great-great-grandfather, JOHN PEARSON MINOR of Greene County, Pennsylvania. It is an undated description of the winter weather–I have yet 160 rods along my fence that was 30 feet wide and was between four and five feet deep(with snow) but it has settled down to about 3 feet–and reports about his children’s plans. His eldest boy, John, is of age (b. 1839?) and wants to be doing for himself talks of going away this spring. and take a receipt from the station agent for them and send it to me by mail. Abia then requests his mothers likeness which you can have taken and send it in a letter and Isabel says you have yours taken on horseback I wish you would send me a copy of it it can be taken on paper or leather and sent in a letter. Abia Minor closes his letter with salutations to his brothers and sisters, a plea for letters from them and a pledge to answer back.